Big name game companies running out of excuses for creating games with no credible female characters. New research into gaming habits in the UK has found that female gamers now outnumber men. And this growing popularity of gaming among women could mean that the industry will become more inclusive and less tolerant of sexism. The study, commissioned by the Internet Advertising Bureau (IAB), revealed that women make up 52 per cent of the gaming audience, a 3 per cent increase from 2011. Although the rise of smartphone and tablet use is thought to have influenced this figure, the study also found that 56 per cent of female gamers have played on a console. This is significant because big name game companies are running out of excuses for creating games with no credible female characters, or with dated, sexist tropes which purposefully exclude women from what has long been seen as a ‘boy’s club’. Now they will no longer be able to cling on to claims that women aren’t interested in gaming, or that it is too time-consuming or complicated to animate female characters and costumes. Anita Saarkeesian is one person who has railed against the sexism in games culture in her web series Tropes vs Women. In response to the series, Saarkeesian has faced an onslaught of sexist comments from outraged male gamers, and threats to herself and to members of her family. Indie game developer Zoe Quinn has also faced a similar backlash following the release of her game Depression Quest, with gamers sharing her personal details and making harassing phone calls to her parents. The fact that gaming has become so popular amongst women could mean that such instances of misogyny will not escape without a fight. The Zoe Quinn backlash sparked what is being referred to as ‘Gamer-gate’ with both women and men in the industry showing their support to Quinn and Sarkeesian. 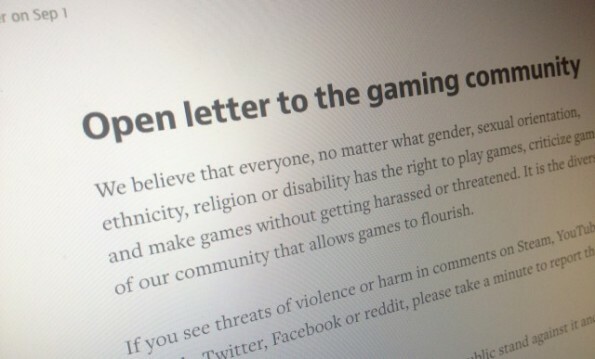 The recent launch of a petition to end harassment is a glimmer of hope that the gaming community could be steadily becoming more inclusive. In an ‘Open letter to the gaming community’, Andreas Zecher wrote: ‘We believe that everyone, no matter what gender, sexual orientation, ethnicity, religion or disability has the right to play games, criticize games and make games without getting harassed or threatened. The sense of solidarity and community amongst women in gaming is on the rise. Social networking sites like Tumblr are helping women to connect with each other and to create their own space in a sphere that would have otherwise excluded them. More and more panels and conventions feature all-female lineups. With so much creativity and active, inspiring discussions taking place, it is clear that feminism is well and truly making its presence felt in gaming culture.